Research information that will be posted in the March Update to the 20th anniversary 2017 edition of IC Insights’ McClean Report shows that fabless IC suppliers represented 30% of the world’s IC sales in 2016 (up from only 18% ten years earlier in 2006). As the name implies, fabless IC companies do not have an IC fabrication facility of their own. 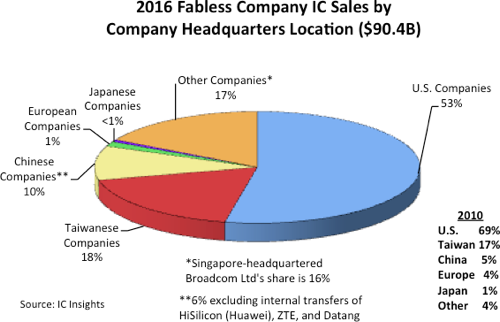 Figure 1 depicts the 2016 fabless company share of IC sales by company headquarters location. As shown, at 53%, the U.S. companies held the dominant share of fabless IC sales last year, although this share was down from 69% in 2010 (due in part to the acquisition of U.S.-based Broadcom by Singapore-based Avago). Although Avago, now called Broadcom Limited after its merger with fabless IC supplier Broadcom became official on February 1, 2016, has fabrication facilities that produce III-V discrete devices, it does not possess its own IC fabrication facilities and is considered by IC Insights to be a fabless IC supplier. 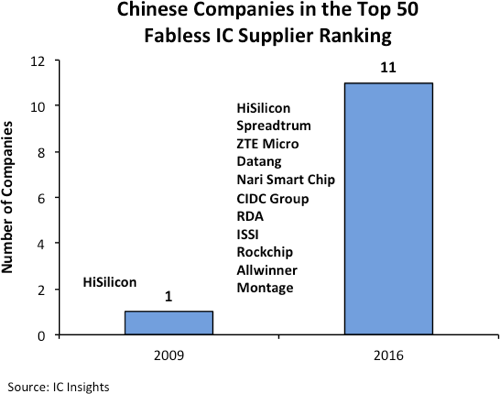 Figure 2 shows that in 2009, there was only one Chinese company in the top-50 fabless IC supplier ranking as compared to 11 in 2016. Moreover, since 2010, the largest fabless IC marketshare increase has come from the Chinese suppliers, which held a 10% share last year as compared to only 5% in 2010. However, when excluding the internal transfers of HiSilicon (over 90% of its sales go to its parent company Huawei), ZTE, and Datang, the Chinese share of the fabless market drops to about 6%. European companies held only 1% of the fabless IC company marketshare in 2016 as compared to 4% in 2010. The reason for this loss of share was the acquisition of U.K.-based CSR, the second largest European fabless IC supplier, by U.S.-based Qualcomm in 1Q15 and the purchase of Germany-based Lantiq, the third largest European fabless IC supplier, by U.S.-based Intel in 2Q15. These acquisitions left U.K.-based Dialog ($1.2 billion in sales in 2016) as the only Europe-headquartered fabless IC supplier in the fabless top 50-company ranking last year (Norway-based Nordic Semiconductor just missed making the top 50 ranking with 2016 sales of $198 million). There is also only one major fabless Japanese firm—Megachips, which saw its sales increase by 20% in 2016 (8% using a constant 2015 exchange rate), one major South Korean fabless IC company (Silicon Works), and one major Singapore-based (Broadcom Ltd.) fabless supplier.